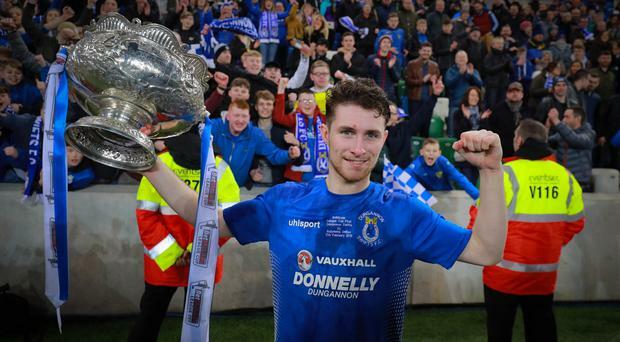 Dungannon Swifts have won their first ever national top level title, beating Ballymena United 3-1 in the BetMcLean League Cup final. It was a victory inspired by winger Ryan Mayse, who ended the game with two goals and an assist, that for the pick of the game - a real pearler from Cormac Burke. The Swifts were cruising to success after Burke's 55th minute effort and managed to see out the win despite captain Ryan Harpur being shown a straight red card with nine minutes left. The Swifts were beaten in their only previous major final, the 2007 Irish Cup final against Linfield. Dungannon led 2-1 at the break thanks to that man Mayse. He blasted home the opening goal in fine fashion, getting on the end of a Harpur knockdown. The captain deserves full credit for having the presence of mind to find his winger and Seanan Clucas deserves as much gratitude for Mayse's second. He delivered a pinpoint cross that Mayse converted at the second attempt. That was after Kyle Owens had headed Ballymena level from close range, getting on the end of an in-swinging corner. United had enjoyed much of the first half possession but couldn't make it show on the score-sheet. After the break, Dungannon seemed buoyed, getting on the front foot and earning their rewards when Cormac Burke curled home a spectacular effort from outside the box for 3-1. They were made to work for the win after skipper Harpur was dismissed on 81 for an off-the-ball incident involving United defender Kofi Balmer.